Mayor, S. D., B. M. Morley, S. M. Spuler, S. C. Himmelsbach, D. Flanigan, T. M. Weckwerth, and T. Warner, 2007: Elastic Backscatter lidar observations of a gust front passage over Washington D.C. on 7 May 2004. Paper 9.7 in the Seventh Symposium on the Urban Environment, American Meteorological Society, 10-13 Sept. 2007, San Diego. 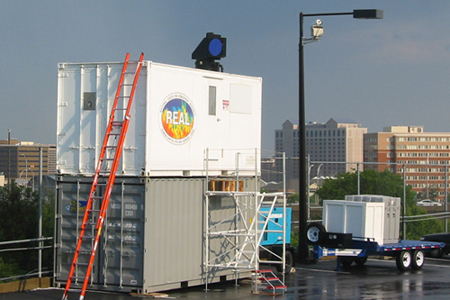 Deployment of REAL in Washington DC. The Raman-shifted Eye-safe Aerosol Lidar (REAL) scanning horizontally just above rooftop and treetop level in Washington DC on 7 May 2004. Warner, T., P. Benda, S. Swerdlin, J. Knievel, E. Argenta, B. Aronian, B. Balsley, J. Bowers, R. Carter, P. A. Clark, K. Clawson, J. Copeland, A. Crook, R. Frehlich, M. L. Jensen, Y. Liu, S. Mayor, Y. Meillier, B. Morley, R. Sharman, S. Spuler, D. Storwold, J. 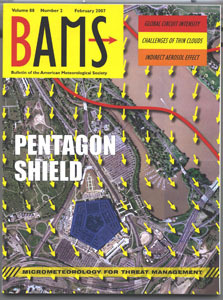 Sun, J. Weil, M. Xu, A. Yates, and Y. Zhang, 2007: The Pentagon Shield Field Program Toward Critical Infrastructure Protection. Bull. Amer. Met. Soc., 88, 167-176. Newsom, R., D. Ligon, D. Garvey: 2009: Dual-Doppler Lidar Observations over Washington DC . Oral presentation & paper 2.2 in the American Meteorological Society's 4th Symp. on Lidar Atmospheric Applications. 10-15 Jan 2009, Phoenix, AZ.